My First Home Decor | Tips For Decorating Your First Home. Tips For Decorating Your First Home. Think about how many sinks you have in your house. They’re all over the place! Adding a copper sink to your kitchen, bathroom, or another part of your house is a great way to add style and class to your decorations. Now we’ll look at how to effectively care for a copper sink so that it will maintain its good look and last longer. Copper sinks can add an attractive accent to any room, in a place where people often expect dull porcelain or brushed metal. Copper evolves with time as it reacts with its surroundings. You will notice that with time, your copper sink will look even more beautiful (or worse) depending on how you treat it. Ensuring that your sink improves its attractiveness with age requires proper cleaning techniques. Cleaners.You do not need to have any specific cleaners. In fact, if you use hard cleaners on a copper sink with a patina (weathered finish), chances are that you will hurt the surface of your sink. Use a soft cotton cloth to clean your sink. Avoid using hard chemicals too as they will damage your sink’s finish. Hard waterIf you happen to have hard water running through your tap, do your best to keep your copper clean. Dry it with a soft cloth after washing. Hard water gives copper sinks a spotty, unattractive appearance, especially on hammered copper sinks. To prevent this further, apply wax on your sink periodically. This will allow your sink maintain its luster. Acid foods. Avoid leaving acidic foods on your sink surface for a prolonged period of time. Foods like tomatoes, oranges, lemons contain acids that leave a shiny spot on the finish of your copper sink. If this happens accidentally, just wash the sink with soap and water and wait for the finish to recover its patina. 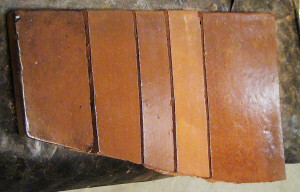 The copper will age with time and the spot will gradually blend in with the rest of the sink. For custom copper sinks with natural reddish color, the maintenance process remains the same as it is for dark and clear brown finished sinks. However, you are advised to apply lacquer regularly to help protect it and slow the aging process. 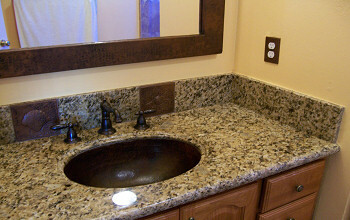 To maintain shiny and washed finishes on your custom sink, you will need to consistently care for your sink. 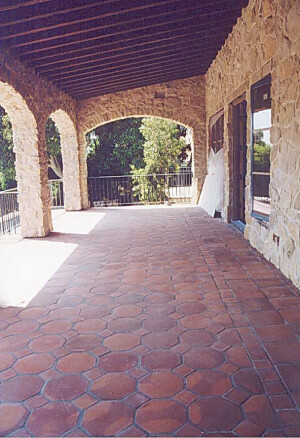 An acid wash also helps in obtaining a beautiful bright look. Remember to rebuff and clean your sink with a copper cleaner regularly. If your sink is in a kitchen or another place where you don’t want to use copper cleaner, you can also make an organic copper cleaning product with equal parts lemon juice and salt. After cleaning your sink, protect it’s surface with wax coating. If you adhere to these instructions, your copper sink will continue looking beautiful and new. Hammered copper sinks vary in many ways. Their glorious appearance is indescribable. And most of all, they do have life within them!!! Copper being a living metal makes lots of changes to its hue, gloss and texture. Well it’s the patina that changes on its own with the time. The advantage you get out of that is the everlasting new look. Living color changes in the patina makes it look all anew day by day. However, using a hammered copper sink in the kitchen means a way of showing one’s wealth. Why? Because, only a wealthy person can afford such a celebrity to the kitchen. Just think about the look given to your kitchen by a steel or ceramic sink. It’s totally different from that of a copper sink. 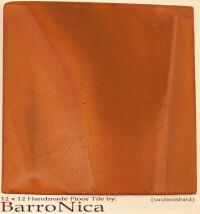 Certainly, copper adds a plain, rustic elegance that none can surpass. Wondrously carved or embossed designs at the front or beautifully shaped front edges make it still more rustic and valuable. Further, it improves the overall appearance and breathes in a new life to the kitchen. 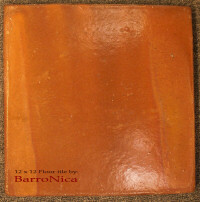 Mexican hammered copper sinks are far more different in style, quality and appearance than most of the others. They are unique in build and all hand hammered by skilled, hard working Mexicans. The value given to their labor is the exciting new look of the end product. They improve the kitchen functionality at large and become a great help to your daily household chores. Mexican hand hammered copper sinks are such marvelous products that everybody loves to own one at least once in their lifetime. Copper excels in many ways than other sink-making materials like steel and ceramic. The medicinal value, aesthetic value and its anti-corrosive property add still more plus points and a value to the product. Hammered copper kitchen sinks provide their optimal service to the customers. The surface of the sink should be very carefully handled. Even a slight stain on the surface can mar the whole product. If you continue a daily clean up procedure, you’ll be able to use it for a lifetime without any complaint. Hammered copper kitchen sinks come in various shapes, sizes and designs. Some are with elegant carved designs whereas some others are kept plain and polished. But, irrespective of the design every hammered copper kitchen sink serves its own duty of maintaining the overall elegance of the kitchen. We have found a lot of websites selling copper sinks, but also noted that www.finecraftsimports.com is one of the few that sell them from Mexico, which, by far are the best ones in craftsmanship. 5 tips to maximize your bedroom square footage, by choosing the right type of furniture. We all wish for a little more square footage in our bedrooms. Space, especially in the city is becoming scarce. More and more we find ourselves in trying to maximize our square footage and especially in our bedroom. When we get home and it’s time to unwind we don’t want to open the door and jump over the bed to get to our closet. You can follow these 5 tips that will help you maximize your square footage in your bedroom. Create an illusion of a second window. Let more light into the room. Will create a sense of depth. If a full size mirror is used this takes away the need for a dresser mirror. Go vertical. When space is limited the best way is to go up, this will help keep your storage needs vertical and it will eliminate some furniture pieces. Use a chest of drawer instead of a dresser this will help save even more space. Maximize your storage space without taking more precious space from your room by buying a bed with drawers underneath. Most beds with drawers do not required a box spring therefore saving you some money. Different purpose. There are many pieces of furniture that can be used for other than its intended purpose. A great piece of furniture that can be re-purposed is a book case. Normally if you have a long closet you may run out of clothes to hang then you can use a book case and fold your close in there this way it will become more visible. Color. If you have a small room always go with light colors since darker bold colors will tend to make a room feel smaller, light colors will retract away and give more of an airy feeling. You can get a light color bed frame and accent it with dark night stands to create a contrast. How To Hang Properly Venetian Mirrors? Generally, most wall mirrors are light weight and are easy to hang. How ever Venetian mirrors has a lot of weight making the decorative mirror a little difficult to hang. In a case where you don’t find your self handy, it might be worth hiring a professional handy man or carpenter to install properly your Venetian mirrors.If you are sure and confident enough that you have good handy skills, here are some tips how you can properly hang Venetian mirrors so it will be the best decorative mirror of your choice from all your wall mirrors.Most Venetian mirrors are already supplied with hanging wires and screws making it a little easier for hanging. But you will still need a hammer, hand drill or screw driver and some other tools to hang the decorative mirror properly. It is strongly recommended to have some one helping you while hanging the decorative mirror. First you have to find the proper place that is ideal for wall mirrors. Adjust the height of the Wall mirrors so it that the center of the decorative mirror is at the eye level. The proper place should seem so, that when a person standing a few feet away from the Venetian mirrors should see their face and shoulders when facing against the Venetian mirrors.After locating the proper height you should hold the decorative mirror against the wall where you would want it to mount, and draw a line (with a pencil) on the wall, around all sides of the wall mirrors. Then mark the centers of the top and bottom lines. Draw a line from the top center mark down to bottom center making the two centers marks joint. Measure the distance between the center line that you just drew and the right side of the mirror. Draw another vertical line half way between these two lines. Repeat the process on the left side. Make a mark one-third of the way down the lines that you just marked. If you have a mirror and it either needs a frame or needs a new frame you can build one cheaper than it may cost to buy one. You will need some tools but it doesn’t take very much skill to properly build a frame for your mirror. You will need a saw, preferably a miter saw but a standard hand saw will be sufficient. You will also need wood glue, a hammer and small framing nails.The first step would be to making the base which will but the main support holding your mirror. Depending on the size of your mirror you may need different size wood to build your support. To build a 24 inch by 24 inch mirror I would use a ½-1 inch by 2-3 inch piece of wood. After you measure and cut the pieces of wood for your support you should lay it out how it will be constructed. Lay your mirror on top of the wood. Your mirror should lay about halfway into the support. Trace the mirror and now you know where to cut your grooves. You need to cut into the wood about as thick as the glass that way it can easily sit into your support. All four sides should have the same size groove and now you can put them together using framing nails and wood glue.Now that you have your support made you can buy some modeling at your local hardware store. This will be placed on top of your mirror and frame to give it a finished look. You can buy stain and stain your modeling and support if you do not like the normal wood color. If you decide to stain it, be sure to buy a clear coat to finish the stain job. When cutting and measuring your modeling you need to cut at 45 degree angles, which is why a miter saw it preferred but it is possible with a hand saw. Now that your pieces of modeling are cut and stained, you can assemble them. Use wood glue to connect them and use masking tape to hold them together while the glue dries. Now that your modeling is assembled and glue you can lay it on top of your support and mirror. Once you confirm the sizes are matching up you can glue the model to the support. Use masking tape to hold it until the glue dries. You should also take framing nails from behind the support and hammer them through the support wood into the modeling. Once you are done with the nailing and the glue has dried you just need to frame wiring to run in the back of your frame and it is ready to hang on your wall. Bathroom mirrors add to the decor and elegance of your entire home as most of the mirrors today are designed with some of the best features. These mirrors are available in various shapes, sizes, designs and prices to suit almost all kinds of interior decors. Unlike the earlier days when mirrors stood as simple accessories to view your reflection, the modern mirrors are symbols of sophistication, charm and elegance. However, there are many things to consider before you choose mirrors for your bath. The size, color, frame and designs can vary from product to product. So it is necessary to consider these facts before you choose to buy mirrors to emblazon your entire home. 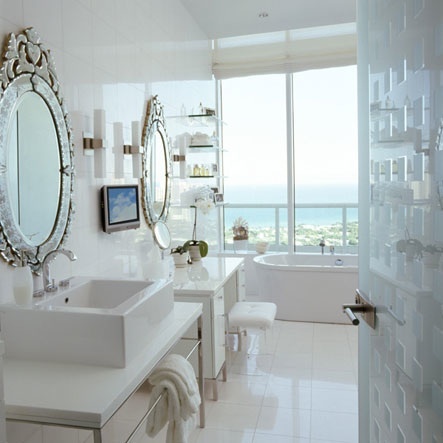 Bathroom mirrors are classified according to its designs, shapes and sizes. Framed mirrors: Some of the mirrors have exclusive and beautiful frames of different designs and shapes. Frames are available in different varieties including copper, silver, wood, brass and so forth. Frameless mirrors: The use of frameless mirror is also popular these days as it creates an alluring appearance in any bath. Hanging mirrors: The hanging bathroom mirror is available in different shapes, sizes and designs to suit different types of homes. Most of these mirrors are quite stylish and chic. The hanging mirrors are available in different sizes ranging from small to large mirrors which can be hung in the rooms. Fixed mirrors: One of the most conventional and functional type of mirror includes the fixed mirrors which can be utilized for various purposes. Fixed mirrors include cabinets and doors to store various toiletries. Mirrors with cabinets are very useful as it stores all essential items in an orderly manner. In the earlier days, most of the baths had mirrors with cabinet doors which have sufficient number of shelves to store soaps, shampoos, first aid kits and creams. Although it was not considered a glamorous or sophisticated variety of mirror, it was still used in most of the homes for its functional purpose. A few days ago I received an email from one of the members of my e-letter. Her name was Karen. She wrote me to ask me for some information on wall mirrors. In her letter she asked me to give her an idea on what her options are in respect to the different types of wall mirrors. She was interested in what is available in wall mirrors with respect to mirror theme, style, framed, frame color, frame material, frame finish, frameless, shape, orientation, and any additional information which would help her in her search for several wall Hammered Copper Mirrors in her home. So what I did was break down each of the topics on wall mirrors she wrote in her e-mail and provide information on each of them. This way she would have a good knowledge of wall mirrors in general. I started out with “Wall Mirror Theme.” When it comes to the theme of a wall mirror, your choices are Floral, Nautical, Tropical and Exotic. If you go online and browse through mirror specialty stores, you will find good examples of these themed wall mirrors.Next on the list is “Style.” Here she had a large variety to choose from. Your choices of styles of wall mirrors are Commercial, Oriental, Transitional, Novelty, Modern/Contemporary, Traditional, Ornate/Gothic, Venetian, Casual, Mission, Craftsmen, Shaker, Children’s, Tropical and Exotic.